An airport spokesman said the information screens were taken offline early on Friday to contain an attack similar to so-called "ransomware". They are now working again at "key locations" including in departures and arrivals, and work is continuing to get the whole site back online. 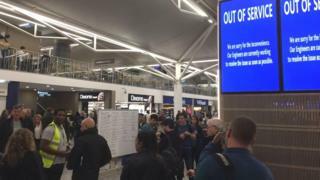 Mr Gore said flights were unaffected, but contingency measures and "manual processes", including whiteboards and marker pens, had to be used in place of display screens. He said it had taken "longer than people might have expected" to rectify due to a "cautious approach".